We’re two days away and some of us have already started the drinkying. Whisky waits for no one. But if you’d like to wait until St. Patrick’s Day is actually here to have your fun, then Vegas has the festivities for you. We’re talking parties, parades and a truly stupid amount of green things that should probably never be green. We’ve got music, dancing and Vince Neil for some reason. And somehow it all makes sense once you’re waist deep in Jameson. Let’s get started. Anyone know where we can get one of these for our office? 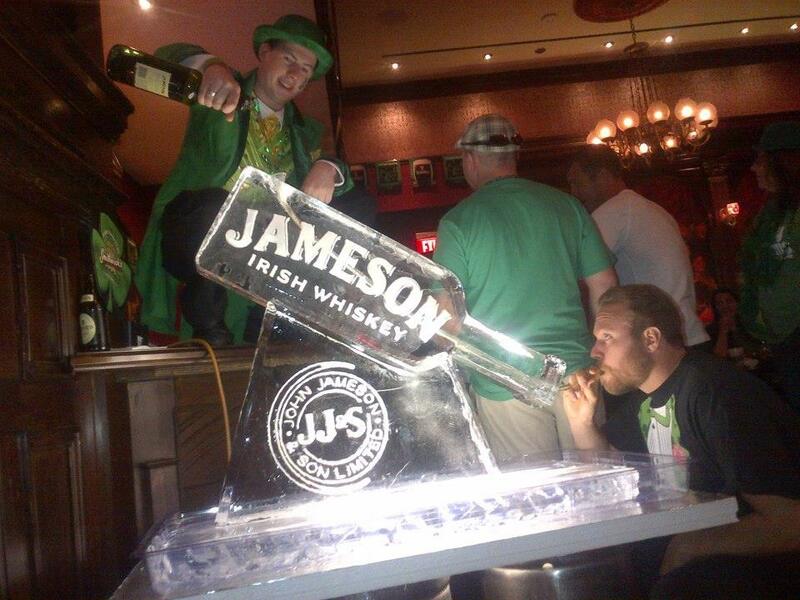 The ice sculpture, not the leprechaun. We’re flush with leprechauns over here. Photo courtesy of Rí Rá. Can you believe Rí Rá has been around for five years? It feels like just yesterday we were slamming back Jameson shots while our friends tried desperately to get us to quit dancing. We’ve just been informed that that was yesterday and that we forgot to close our tab. Welp. That’s what happens when you party at Rí Rá. Good times. In honor of five fantastic years, and another St. Patrick’s Day in the bottle, Rí Rá is having a four-day fest featuring live music, a specialty menu and more. Bagpipers will entertain you, as much as a bagpipe ever really can. Giveaways will keep you coming back. And the drinks will leave you saying, “Wait… no it’s cool… i can totally River Dance… just watch this!” We’re your friend, but we’re not gonna try to stop you. It’s gonna be hilarious on YouTube. If we find the end of the rainbow can we get hair like that? #want. Photo courtesy of O’Sheas and Erik Kabik. 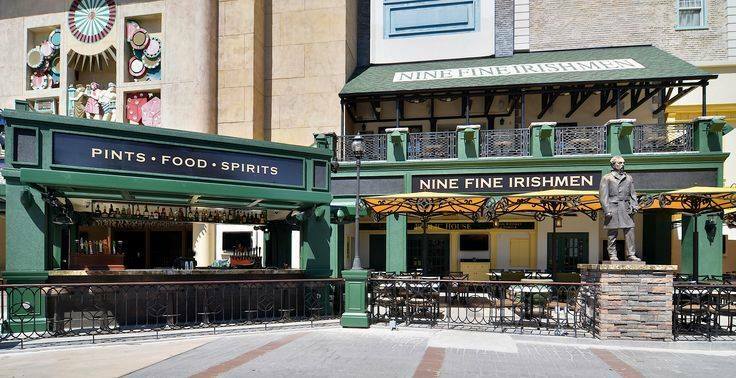 The gorgeous outdoor mall that is the LINQ Promenade will turn into a gorgeous outdoor party as bagpipers, Irish dancers, stilt walkers, a drumline and much more parade throughout the space well into the night. They’ll also have outdoor games and beer carts set up, just in case the half dozen or so bars down there can’t keep up with demand. You can stroll the entire length of the Promenade, taking in all the sights, or plant yourself at one of the many fantastic bar patios like ameriCAN or Tilted Kilt and just let St. Paddy’s Day happen all over you. 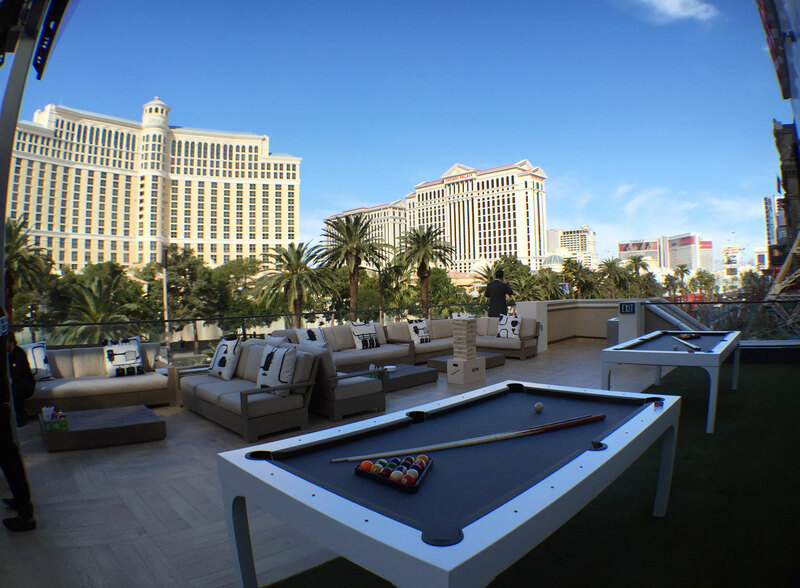 And if you want an even bigger thrill, the High Roller will have its signature views as well as specialty cocktails. Since the party goes all day, why not do all of those things? Hold onto your lucky charms while riding the zip line. 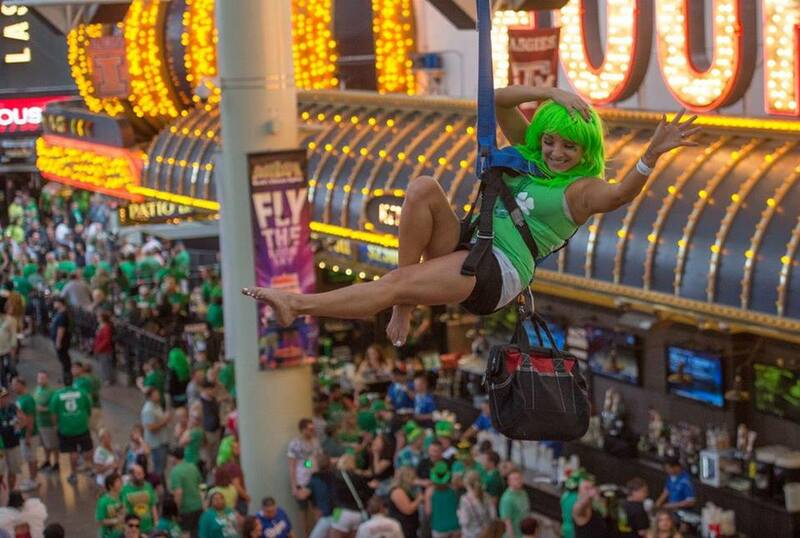 Photo courtesy of Fremont Street Experience. Downtown Las Vegas loves a parade. And we all love our brave firefighters. So for St. Patrick’s Day they’re bringing it all together for the Las Vegas Valley Firefighters St. Patrick’s Day Invitational Parade down Fremont Street Experience. Bagpipers and Irish steppers will perform during the parade and the whole event will culminate in a massive street party at the Downtown Grand. 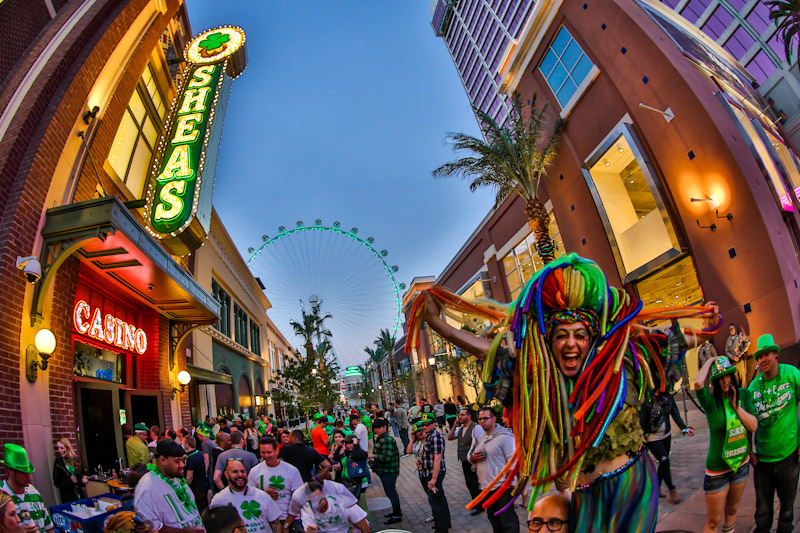 If you’ve never experienced a major event in Downtown Las Vegas, this will be a good one to pop your shamrock. Drinks will be pouring from all the bars along Fremont Street, and once the party hits the Downtown Grand, everyone will get in on the action. Triple George Grill, Sidebar, The Commissary, Pizza Rock and Hogs & Heifers Saloon will all be contributing to the fun. They say everyone’s Irish on St. Patrick’s Day. And as far as we’re concerned, everyone’s a part of the Downtown Las Vegas scene too. That bar looks lonely. You better go give it a nice long hug. Photo courtesy of Nine Fine Irishmen. According to our researches, there’s another New York, New York in the world, and apparently they do some big St. Patrick’s Day parade. We, of course, don’t believe them. It’s clearly an early April Fools prank. So we’re going to keep focusing on the parade that will happen in our New York – New York Hotel and Casino on St. Pat’s Day. The Celtic Feis celebration will last from March 17 – 19 and include amazing food, specialty drinks, live music, interactive media and a parade led by traditional bagpipers. That’s right, more bagpipers. Just give in to the bagpipes. Let them… let’s go with soothe… soothe you. And once you’re all soothed up, head into Nine Fine Irishmen, the bar so Irish it was built by nary a sober or well-tanned man. True story. Even if there is another NYNY somewhere in the world, it can’t hold a candle to the St. Paddy’s Day party going on in this town. For as authentic an Irish experience you can get in the desert, step on down to Celtic Feis. Jenga was invented in Ghana. That’s just a fun fact that has nothing to do with anything. And you can play giant Jenga at Beer Park, maybe with Vince Neil if you ask nicely. Nothing says St. Patrick’s Day like the lead singer of a vaguely German sounding hair metal band drinking American beer at a hotel/casino named for a French city. They probably call that synergy or something. We just call it one hell of a good way to spend St. Pat’s Day. Be sure to check out our St. Patrick’s Day Page for even more info on dining specials and Irish pubs. And if you want something truly authentic, go see Michael Flatley’s Lord of the Dance in its final performance at The Colosseum at Caesars Palace. Sláinte! I came from a little town in the Midwest. And believe me, I’m never going back. It’s probably nice if you love grass and snow; but I love the lights, the glamour, and the flocks of tourists seeking fun and fortune. Once the sun goes down, I’ll be the first one out hitting the clubs or just wandering the Strip for a little nighttime adventure. Passing through Bond on my way to Lily Bar, or taking a shortcut through Double Helix before landing at Parasol Up/Down, I’m the one you’ll randomly bump into – only sometimes literally – strolling through Sin City’s liquored veins – and loving every minute of it.